This is a S3 post. 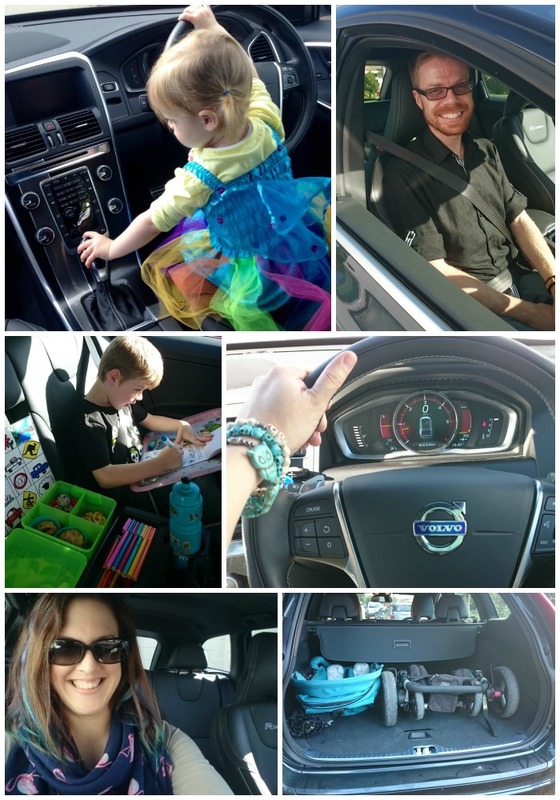 I drove the Volvo for a week. Driving a car for the specific purpose of reviewing it made it glaringly obvious that MG and I look for very different features in a vehicle. I'm all about the dashboard and ease of use, while he is all about handling, and whatever it is that is under the hood. Engine thingies? We took this role very seriously so we could present a his and hers review. And oh look, I am such a blatant stereotype it makes me sick. Also, MG writes like he's about to start working for an auto mag, and I'm all conversation and swearing. Dude makes me look bad. Volvo is a European marque with a history of making premium cars for over 80 years. 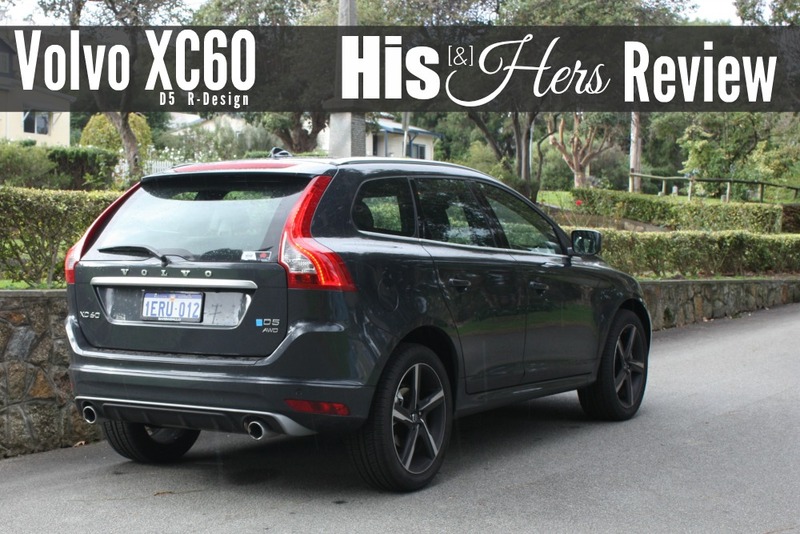 The XC60 is the company’s second foray into the SUV market and a 2014 update means this car is dripping with the latest in automotive technologies. Volvo conjures visions of comfort, safety and practicality and more recently - speed. The model I tested was the XC60 D5 R-Design; which means Volvo finished a perfectly good D5 Luxury model and handed it over to the mad racing scientists at Polestar. What they do with this car is find an extra 11kW of power and 30Nm of torque over the standard D5 and knock the 0-100km/h time down to 8.1 seconds. The twin turbo 2.4L 5 cylinder diesel isn’t silky smooth like others in the luxury SUV class and it’s raspy note is something Polestar have done a great job of enhancing with an excellent dual exhaust set up. While not winning ¼ mile drags, the roll-on acceleration is certainly addictive and many times I found myself having to rein in a speedy right boot. Don’t get thinking the extra tuning made this diesel thirsty either, its 70L tank is more than capable of returning over 800km and we averaged 7.8L/100km on a hilly highway drive. I’ve never heard a Volvo owner complain after a long drive and I can attest that the R-Design seats are the most comfortable I’ve tested in a car. The leather is of a high quality and the dash and interior fit and finish are up with the best. The back seats offer a unique Volvo feature with two-stage temporary booster cushions and a centre armrest that contains cup holders and a fold out storage area. This proved invaluable on a country drive with Tricky arranging his lunch box and colouring materials in the middle for easy access. When you need to get work done the XC60’s rear bench folds completely flat making it ideal for hauling large items. Made even easier with a high opening button activated tailgate. It’s no slouch with a trailer either; 2000kg tow rating making it an ideal family solution. The full height taillights are a handy feature in the car park with a light button on the key fob illuminating these and the day-time running lights to help me find my way back with a full trolley. The XC60 R-Design tops the XC60 range and as such features many of Volvo’s state of the art active and passive safety technology. City safety technology prevents the car colliding in low-speed traffic, two rear parking cameras made it so easy to reverse park and bi-xenon headlights use GPS and steering inputs to turn up to 15° to help see around the next bend. Combining this with state-of-the-art ABS, Traction Control and optional extras like lane departure warning and blind-spot information systems you will make no mistake, this is a 5 star safety rated car. Unfortunately not all R-Design extras impressed. Like the flappy paddles – well placed and beautiful they don’t work particularly well with a diesel engine and I found myself instead using ‘S+’ with the gear leaver rather than manually working through the 6 gears. The tachometer is entirely digital which means you can change the display to suit your tastes; I’d have liked to see more than the 3 options and was amused by an “Eco” mode that showed a speedo reaching 260km/h! Infotainment systems have quickly become a make or break item for new car buyers. The XC60 R-Design comes equipped standard with a 5 inch LCD screen and is controlled by a dial in the central binnacle. Reaching over to adjust settings became an occasional frustration as this was one of 4 dials arranged around no less than 31 buttons! The voice and steering wheel controls however are very handy options (have a car reading you a shorthand text message is hilarious). All in all the Volvo XC60 R-Design impressed all who came near it. Stunning looks (it really is handsome with the optional 20 inch wheels), a quick and economical diesel engine and some of the most comfortable surroundings a travelling family could ask for. I would have liked the entertainment system to join the Android Auto or Apple CarPlay revolution, probably a victim of timing rather than any other constraints during the latest update. This is the type of model a small family should shop for when opting for a single car. Sporty, luxurious, practical; plenty here for everyone to enjoy. HER REVIEW - Glow does the school run and heads to the shops. Over and over again. When I jumped in to the XC60 and inhaled that new car smell deep in to my lungs, I felt a sensation somewhere between exhilaration - were they really going to let me just drive out of here? Didn't they hear me say "the faster the better" during my hot lap? - and sheer terror. An expensive car that I have to give back in one piece? Bring on the granny driving and jokes about being a "bloody Volvo driver". I headed out of the Cannington Volvo lot and by the time I was on the highway I'd already turned the wipers on three times attempting to indicate, and fallen in love with the leather seats. With the hug like hold of a racing seat (but with support and padding) and seat warmers cranked, my tooshie was loving it. Tricks thought the in-built booster in the XC60 was the bomb. It was his first experience without a five point harness and the thought of being a "big boy" was very appealing to him. A fabulous concept which worked great for us, though I'd be concerned that on long journeys a child could fall asleep and lean in to the wrong position affording them little protection in the event of a collision. Though this is a concern with any child in a booster without a five point harness and isn't specific to the Volvo. I used the car mainly for school pick ups and grocery shopping, and I tell ya, I felt a bit posh! Sleek lines and the throaty rumble of a diesel, the XC60 definitely turned heads. Shopping was a breeze with the automated tailgate and I found myself wanting to show it off "Oh, you have a handbag? Let me open the boot for you" *press* "You want to keep it on your lap? No problem, I'll just close it" *press*. Speaking of the boot, it's pretty massive and passed my gigantic-pram-the-size-of-a-boat test with flying colours. I'm disappointed they didn't keep the cool opening and closing function going on all the way around and have keyless entry - that is a godsend when you've got your hands full with kids and groceries in the middle of a busy car park. But I'm afraid the XC60 didn't make me fall in love with it the way it won over MG. I found the dashboard to be way too busy with OMG SO MANY BUTTONS. The interface didn't seem very intuitive to me and even using the steering wheel mounted control wheel it felt almost like a clunky afterthought. The voice activation alleviated some of the issues at times, but there was still a lot of looking down to figure things out and twiddling of dials to enter information, effectively taking my eyes off the road for longer than I felt was safe. I felt it could have been much improved by a touchscreen (which would get rid of about two thirds of those bloody buttons to start with) and a better GPS system. As it stands it would beep if there was an upcoming speed camera but had no information on current speed limits or if you're exceeding them - I'm quite used to my current car telling me "You are over the speed limit" if my speed starts to creep up and it even adjusts for school zones and road works, so there was a high benchmark to meet there and it just didn't stack up like I expected it to. The XC60 was a joy to drive (S+ mode is brilliant! ), and it really is absolutely beautiful to look at, but it fell short for me. As someone who is in and out of the car a lot throughout the day, keyless entry and a more sophisticated console would be needed before I could consider shelling out for it to be my main ride, no matter how pretty it is.